Our firm has years of experience representing applicants before town boards for a variety of matters. 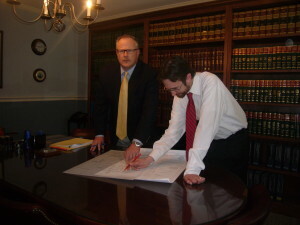 Attorney Moody served as an elected member of the Town of Duxbury Planning Board for five years and is familiar with the permitting process (whether the zoning board of appeals, planning board or conservation commission) for matters including subdivision approvals, site plan reviews, special permits, approvals not required (ANR’s) and variances (commercial and residential development). If your needs include a permit required use of your real property contact our office to guide you through the process. We have developed close relationships with local land surveyors and engineers over the years and can help determine the feasibility of your envisioned project and the “best use” for your real property. The drafting of easements, deeds, restrictive covenants and condominium documents in connection with the use of your property is a regular part of our practice. If your needs include the drafting or the review of such land use documents please contact us for a consultation. Our firm also represents landowners aggrieved by the improper permitting of sites and uses and also includes representation of private land use disputes including, adverse possession, prescriptive easement claims, access and easement issues, boundary disputes and specific performance of land sales contracts.